I recently finished reading Topgrading for Sales, an extremely short (50 pages of text, 50 page appendix) book that talks about how to apply the principles outlined in the book’s much bigger (592 page) brother, Topgrading, specifically to sales positions. Topgrading is a well-respected hiring technique that has is used at companies like GE and Microsoft. Companies that use Topgrading use it to determine who is an “A player” versus who is a B or a C player. The idea is that a team of 90% A players will be infinitely more productive and successful than a team comprised of mostly B and C players. The practice, which calls for multiple extremely in-depth interviews, is a sound one that has been successful for a lot of companies. 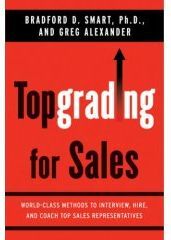 Topgrading for Sales is a good book that’s literally filled with action items and useful advice, but as I was reading it, I was trying to think of ways I could apply the practices outlined for hiring sales representatives to the hiring of customer service representatives. As I was drinking the metaphorical Topgrading Kool-Aid, I thought about some of the ways various companies go about hiring customer service representatives. Through my conversations with various customer service executives, I’ve heard about both extremes and everything in between when it comes to hiring. Some companies do one half hour interview and call it a day, while others have multiple days of in-depth three and four interviews. As one would hope, the latter, while thoroughly exhausting, tends to be more effective. After a bit of research, I found an article by Mike Faith, the CEO of Headsets.com (which I’ve written about multiple times), explaining how his company uses the Topgrading approach when interviewing, hiring, and evaluating customer service representatives. The article was interesting (and complemented the book nicely), but I still found myself looking for a details about how to apply Topgrading to customer service. I’ve since ordered the full size edition of Topgrading (wish me luck as I read through it!) and will post an in-depth review when I finish it. I’m hoping a more in-depth knowledge of Topgrading will give me more insight about how to apply it specifically to customer service hires. In the mean time, if you have or do use it, what has your experience been like with Topgrading? What about the broader task of hiring customer service representatives? I’m sending a couple of emails to a few HR and customer service executives I know and will report back with their thoughts as well.